Tears flow like the Ganges river but my heart is still yearning…. You and I will not get along, as you spend nights with my rival. In Hindustani romantic ragas, love is inexorably tied with separation – whether it is from a sweetheart or a Spiritual Being. The yearning to be united can be interpreted as the soul wanting to break free of this mortal existence, to find its true destiny as much as a standard romantic involvement between two people. 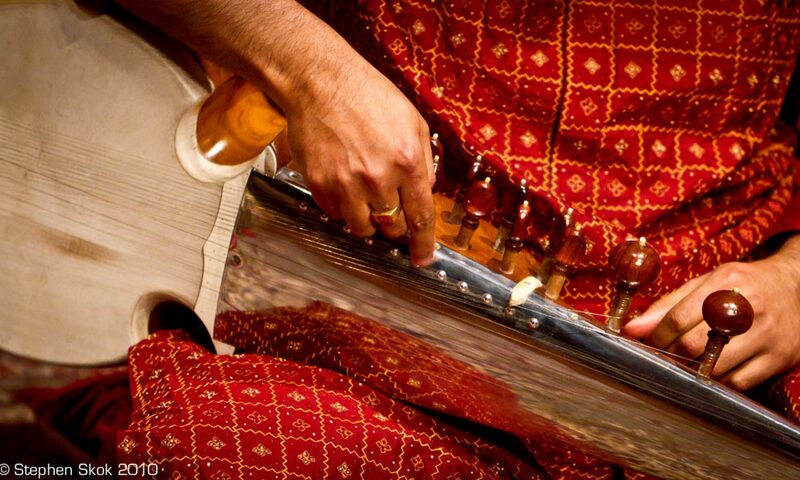 For musicians, it is very important to have a set of feelings and mental image of the raag. As we know, ragas have personalities, and exploring a raga is like meeting a person of that name and getting to know them better – and then unfolding that conversation to the audience in a performance. It is afternoon on the steps of the Ganga in Varanasi- hot but tolerable- the ghats are all deserted, the boats moored to them, gently bumping into each other. Patdeep sits on the step facing the ganga and tells the story of love and loss. This is no hysterical or dejected love- it is a gentle acceptance that the tender moments shared earlier have come to pass and it is very likely that this gentle ache of separation is here to stay. Patdeep describes the history of the relationship first – a story of caring tenderness. With the history of the relationship covered, the tone next become plaintive in nature, the movements become long drawn and the notes go into the higher octave. The sarod really shines in this area as it carries the emotion of the lower notes while brings out the soul crying out in yearning in the higher notes. It allows the space of silence for the emotion to sink in – before spreading the melody and conversation further. The conversation with Patdeep is complete from this point of view. I choose to play Patdeep with this personality in mind. The second interpretation of a lover’s tiff, as shown in the popular composition above – (Mai Tore sang nah jabu) – while the theme of romance runs through it, the conversation becomes one of romantic tension as the object of the love is around, as opposed to the more austere first version. Patdeep in this interpretation is more conversational and not a monologue. The beloved is within reach – and can hear the raga. The tension is still there but it is not one of forlorn sadness. Pilu, Patdeep and Bhimpalasi – all afternoon ragas with similar moods -have similar notes. In Patdeep the melodic line is singular and cannot be deviated from, irrespective of interpretation. Patdeep uses the shuddha ni (Ni) to delineate itself from other ragas, and this is also its most used swara after Pa. Unlike Pilu, Patdeep cannot be host to other notes than itself. This presents a challenge to the player in terms of maintaining freshness of melody without repetition. I have take a small liberty with Patdeep by beginning a phrase with g P, which is strictly a violation of the raga theme. I do this only once, and is inspired by a sarangi lehra that I once heard which had this phrase in it. The phrase N N S(upper) D P, if repeated, gives the impression of a question being answered,a return to the base theme. Can be used depending on the scenario.